1) Build with very strong corners. There is tremendous outward pressure on the frame of any raised bed, because of the weight of all that potting mix, water and plant material. Whichever frame you build, make sure it is "overbuilt" of strong timbers very well connected at both the corners and along the sides. Do not just screw one board into the other at the corners. Screws do not hold well in the end grain of wood, especially under pressure, over time. It's better to put a 4x4 in the inside corner, and then screw both boards into it instead. That way the screws are biting into side grain where the wood fibers will be able to grip the screws. Another raised bed construction technique is to build with 4x4 or 4x6 timbers, using long lag screws to anchor them together in tiers, 3 to 6 tiers high. Lag-screw the second tier onto the first, then the third onto the second, etc. Stagger the screws so they don't run into each other, and countersink them so that they don't stick up above the surface. Make sure your timbers are straight and true, with no bow or twist in them. If you have a long side, 6 feet or more, you might want to also run a rebar rod vertically through the tiers (as explained in the next paragraph). If you want to build out of larger timbers like this, another technique is to drill a 1/2" diameter hole all the way through the tiers (you'll need a long auger bit for this), and pound a 3/8" diameter rebar rod through them to hold them all together. The rebar should be same length as the height of the bed. 2) Don't use regular soil. You MUST use a high quality potting mix to fill your raised bed. 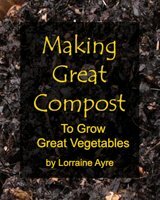 Regular garden soil will compact and harden, and will not provide the plants with enough air or water drainage. See if you can find a local supplier of bulk potting mix (not "topsoil"), usually under "landscape supplies" or "sand and gravel". This will usually be much cheaper than buying 30 or more bags of potting mix from Home Depot, plus, you can either haul it in the back of a pickup or have them deliver it. (Google "landscape supply your city"). 3) Don't use preserved wood or other toxic materials. Use cedar, redwood or other naturally rot-resistant wood for your raised bed construction, but do not use anything "pressure treated" or with creosote in it. These substances are highly toxic (which is why the decay organisms cannot eat it) and will leach into your soil, and from there into your vegetables. And if you decide to use cinder blocks or pavers, make sure you use concrete block made with ordinary aggregate. Many cinder block manufacturers use mining slag in their cinder block, which can contain metal oxides and sulfides, both of which can leach and toxify your soil. 4) Do not use a weed barrier. Many raised bed construction designs out there will tell you to lay weed barrier down before building your raised bed. This is a bad idea because weed barrier prevents organic matter from enriching the soil underneath, and it prevents earthworms from coming up, stopping the development of a healthy soil ecology in your garden. You will also see designs that tell you to lay gravel at the bottom of your bed "for drainage". Gravel is unnecessary if you have used good quality potting soil with perlite or vermiculite in it. The spaces provided by the gravel will eventually fill in with potting soil anyway. However, if you want to lay gravel under just the portion of the bed where the wood rests on the ground, there is an advantage because the bottom of the wood will not rot as quickly. 6) Prepare the soil under the bed. Prepare the natural soil at the bottom of your bed before filling it with potting soil. Deep-rooted crops like carrots, beets and many other vegetables have feeder roots that in nature go down much deeper than the depth of your raised bed, sometimes down as much as 10 feet! Weed your plot well, level it, build the raised bed, and then loosen the soil in the bottom with a spading fork before filling it with potting mix. This will help your plants root more deeply, bringing up nutrients from nature's soil underneath. Attractive - nothing is more beautiful in the backyard than a raised bed vegetable garden spilling over with tomatoes and zucchinis in August! Very easy weeding. Because the potting mix is loose and friable, weeds can be easily pulled up by their roots. Expensive up front. The frame must be built of a rot-resistant wood such as cedar or redwood (don't use pressure-treated lumber or cinder blocks due to leaching of toxins), and you must use potting mix. Not considered "sustainable" in the big picture, because of the inputs of wood and potting mix from off the land. Framed edges are a good hangout for bugs and weeds, especially slugs, earwigs and quackgrass (or crabgrass), which can grow right through the wood. Once the bed is built, you can't change the garden layout. 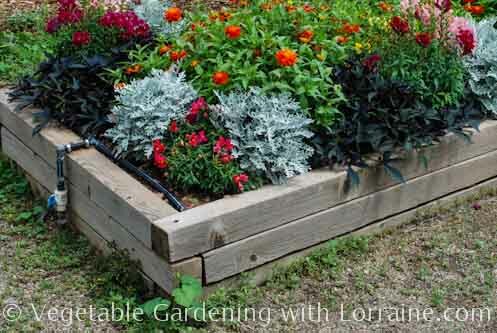 This is a photo gallery featuring 9 different raised bed garden designs. The close-up photographs of the corner details should make it easy for those who are even a little handy to duplicate the construction. Make the dimensions fit your taste or space. The fastest way to get up and growing is with a raised bed garden kit. Just open the box, assemble, fill with potting mix, and plant!. Available in many different designs, raised bed garden kits also come in different sizes and depths to fit your needs. This article is a side-by-side comparison of the best. If you want to use local lumber but don’t have much in the way of tools, you can buy pre-made corners to join your lumber together. 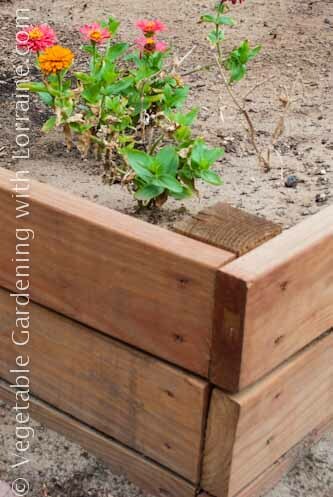 This is less expensive than buying kits, and allows you to make your raised bed garden any width or length. All you need is a screwdriver! There is another type of raised bed, too: one with no frame at all! This is the way I have been gardening most of my life, and it is called double-dug, French intensive raised bed gardening. It costs nothing for building materials or imported potting soil, honors and supports natural soil ecology, and is sustainable indefinitely. You can watch a You Tube video showing how to use the method, if you would like to compare it with framed raised beds. Everyone loves raised beds, and everyone loves strawberries. A raised strawberry bed combines the best of both worlds.